Officers Elected for New Social Organization and Unanimity of Sentiment as to Plans Prevails at First Meeting. Sunken Grounds With Club Balconies Overlooking, is Early Suggestion. 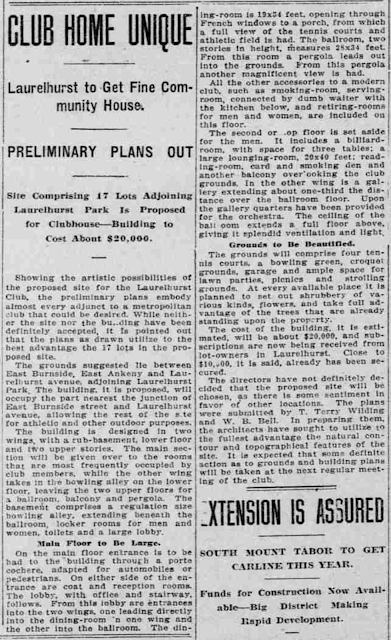 Active efforts are being put forth to erect one of the most pretentious social clubhouses in the city by the residents of Laurelhurst. Plans of a tentative nature have been laid and practical lines of establishing a building fund have been suggested by C.K. Henry. Preliminary meetings have been held, resulting in a temporary organization, with the following officers: President, J.D. 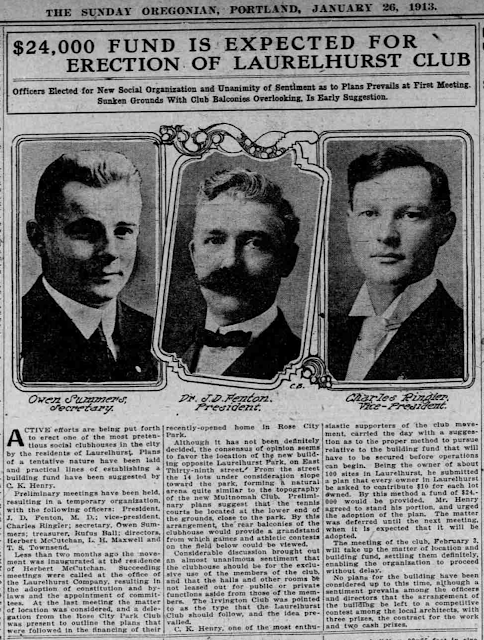 Fenton, M.D. 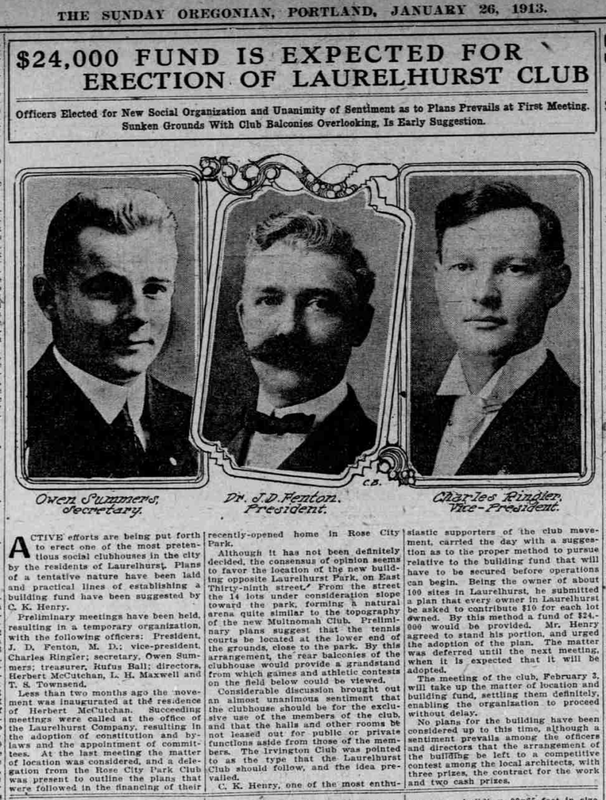 ; vice-president, Charles Ringler; secretary, Owen Summers; treasurer, Rufus Ball; directors, Herbert McCutchan, L.H. Maxwell and T.S. Townsend. Less than two months ago the movement was inaugurated at the residence of Herbert McCutchan. Succeeding meetings were called at the office of the Laurelhurst Company, resulting in the adoption of constitution and bylaws and the appointment of committees. At the last meeting the matter of location was considered, and a delegation from the Rose City Park Club was present to outline the plans that were followed in the financing of their recently-opened home in Rose City Park. Although it has not been definitely decided, the consensus of opinion seems to favor the location of the new building opposite Laurelhurst Park, on East 39th street. From the street the 14 lots under consideration slope toward the park, forming a natural arena quite similar to the topography of the new Multnomah Club. Preliminary plans suggest that the tennis courts located at the lower end of the grounds, close to the park. By this arrangement, the rear balconies of the clubhouse would provide a grandstand from which games and athletic contests on the field below could be viewed. Considerable discussion brought out an almost unanimous sentiment that the clubhouse should be for the exclusive use of the members of the club, and that the halls and other rooms be not leased out for public or private functions aside from those of the members. 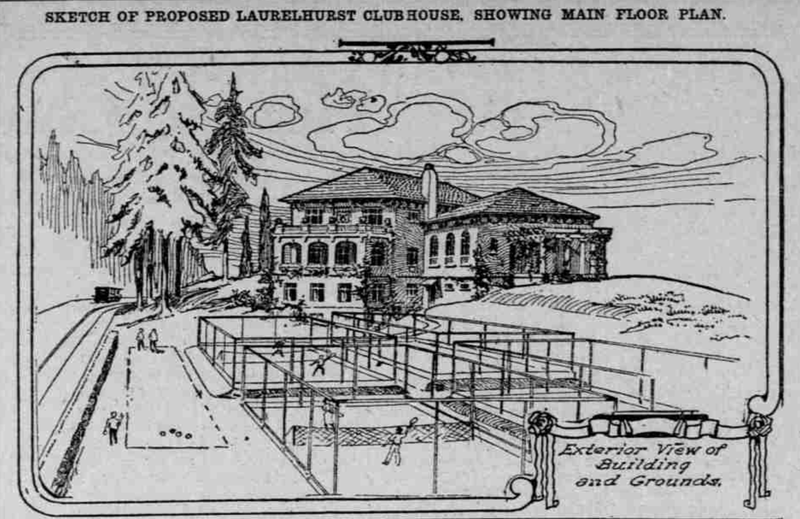 The Irvington Club was pointed to as the type that the Laurelhurst Club should flow, and the idea prevailed. C.K. Henry, one of the most enthusiastic supporters of the club movement, carried the day with a suggestion as to the proper method to pursue relative to the building fund that will have to be secured before operations can begin. Being the owner of about 100 sites in Laurelhurst, he submitted a plan that every owner in Laurelhurst be asked to contribute $10 for each lot owned. By this method a fund of $24,000 would be provided. Mr. Henry agreed to stand his portion, and urged the adoption of the plan. The matter was deferred until the new meeting, when it is expected that it will be adopted. The meeting of the club, February 3, will take up the matter of location and building fund, settling them definitely, enabling the organization to proceed without delay. No plans for the building have been considered up to this time, although a sentiment prevails among the officers and directors that the arrangement of the building be left to a competitive contest among the local architects, with three prizes, the contract for the work and two cash prizes. Showing the artistic possibilities of the proposed site for the Laurelhurst club, the preliminary plans embody almost every adjunct to a metropolitan club that could be desired. While neither the site nor the building have been definitely accepted, it is pointed out that the plans as drawn utilize to the best advantage the 17 lots in the proposed site. 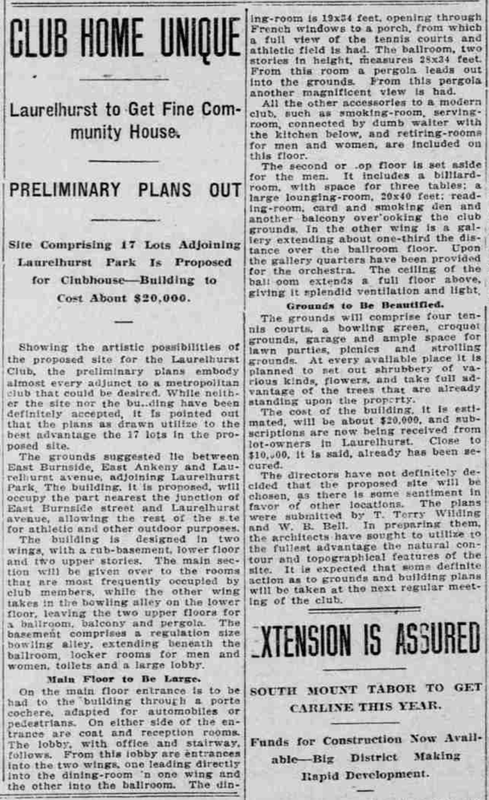 The grounds suggested lie between East Burnside, East Ankeny and Laurelhurst avenue, adjoining Laurelhurst Park. The building, it is proposed, will occupy the part nearest the junction of East Burnside street and Laurelhurst avenue, allowing the rest of the site for athletic and other outdoor purposes. 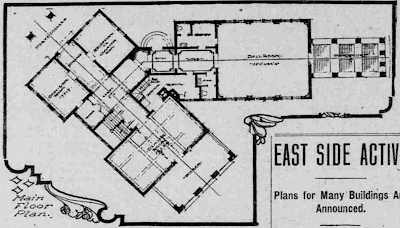 The building is designed in two wings, with a sub-basement, lower floor and two upper stories. The main section will be given over to the rooms that are most frequently occupied by club members, while the other wing takes in the bowling alley on the lower floor, leaving the two upper floors for a ballroom, balcony and pergola. The basement comprises a regulation size bowling alley, extending beneath the ballroom, locker rooms for men and women, toilets and a large lobby. One the main floor entrance is to be had to the building through a porte cochere, adapted for automobiles or pedestrians. On either side of the entrance are coat and reception rooms. The lobby, with office and stairway, follows. From this lobby are entrances into the two wings, one leading directly into the dining room in one wing and the other into the ballroom. The dining room is 19x24 feet, opening through French windows to a porch, from which a full view of the tennis courts and athletic field is had. The ballroom, two stories in height, measures 28x34 feet. From this room a pergola leads out into the grounds. From this pergola another magnificent view is had. All the other accessories to a modern club, such as smoking room, serving room, connected by dumb waiter with the kitchen below, and retiring rooms for men and women, are included on this floor. The second or top floor is set aside for the men. It includes a billiard room, with space for three tables; a large lounging room, 20x40 feet; reading room, card and smoking den and another balcony overlooking the club grounds. In the other wing is a gallery extending about one-third the distance over the ballroom floor. Upon the gallery quarters have been provided for the orchestra. The ceiling of the ballroom extends a full floor above, giving it splendid ventilation and light. The grounds will comprise four tennis courts, a bowling green, croquet grounds, garage and ample space for lawn parties, picnics and strolling grounds. At every available place it is planned to set out shrubbery of various kinds, flowers, and take full advantage of the trees that are already standing upon the property. The cost of the building, it is estimated, will be about $20,000, and subscriptions are now being received from lot-owners in Laurelhurst. Close to $10,000, it is said, already has been secured. The director have not definitely decided that the proposed site will be chose, as there is some sentiment in favor of other locations. 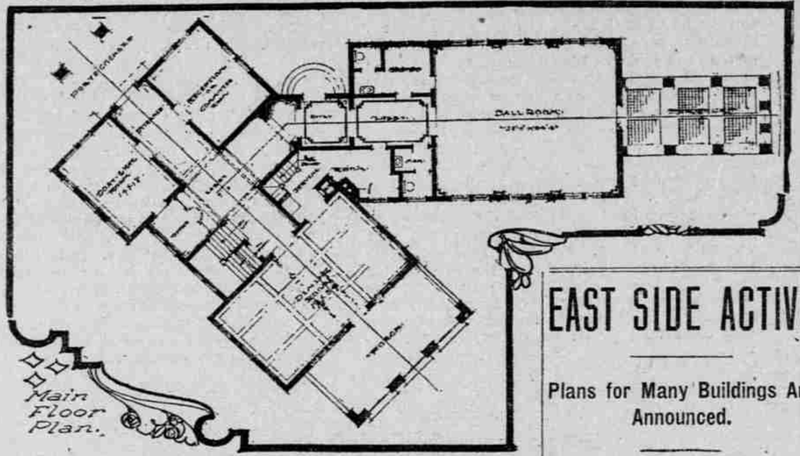 The plans were submitted by T. Terry Wilding and W.B. Bell. In preparing them, the architects have sought to utilize to the fullest advantage the natural contour and topographical features of the site. It is expected that some definitely action as to grounds and building plans will be taken at the next regular meeting of the club.